I won’t embarrass Mauri by listing all the really cool things he did today to make my 64th special. But I can’t resist sharing our unique dining experience. 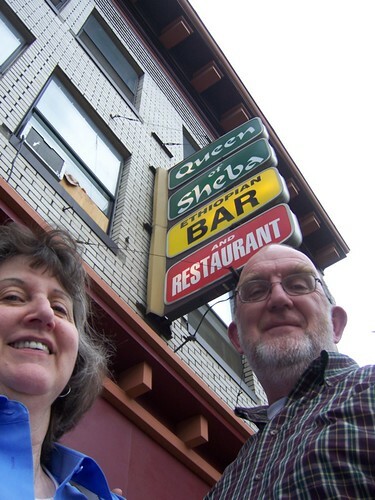 If you saw only the word BAR, you missed the most important part of the sign: Ethiopian. It was a first for both of us. Mauri is by far the more adventurous eater of the two of us, but I braved a couple of mild-sounding menu items. Beef and mushrooms, chicken berbere (what are jalapeños doing in Ethiopian food?) , and salad. 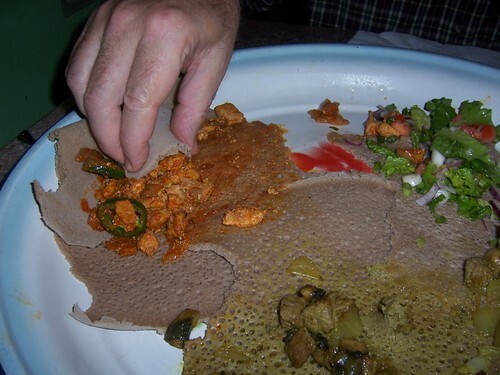 Ethiopians don’t use any utensils, but instead tear off pieces of injera (sourdough flatbread) and use it as a scoop. Right hand eating only; you never know where that left hand has been. We passed up the coffee (buna) ceremony, mainly because Mauri had fixed some Ethiopian coffee earlier in the day. Then there’s the other reason: I never touch the stuff. But coffee is an important part of Ethiopian culture and economy. In fact, the beans Mauri roasted came from a little village 20 miles south of Awasa, where our grandchildren have lived their lives to this point. We’re still waiting for travel dates, but our dining adventure in Portland has begun to prepare me for what’s ahead. Very cool, esp. given the family connection. 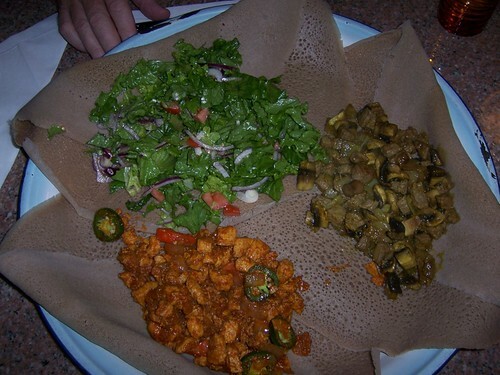 I’ve had Ethiopian and enjoyed it. But the belly dancer afterward? Not so much. Did you sit on pillows on the floor? Nice description of the meal…but nowhere do I see any comment on if it was good or not!!!!!!! So was it? Oh good heavens the Queen is the best place to eat Ethiopian, GOOD CHOICE. The owner is a friend and I used to live across the street. We just went there and it was such a treat. YUMM!!! !